Like a lot of people I thought I knew what BJJ was. I had been training in a variety of martial arts for almost 15 years when I finally decided to dive into Jiu Jitsu. I had some previous grappling experience; some Judo as a child and a little catch-wrestling. We trained throws, sweeps, locks and chokes in my Jeet Kune Do and Kali-Silat classes, but we tended to punch people in the face first so the compliance was there! Sometime back in 2013 that all changed as I finally had my first real taste of Jiu Jitsu. My friend John had been training at ATT in Thailand for a few years and on his return to Manchester a few of us started training with him. I was hooked from the first day. In JKD and Silat I had always been the smallest guy in class but it had never really mattered – I was fast and agile. I could get away from punches and kicks, move and counterattack. Also, once you have poked a dude in the eye a few times, he is pretty easy to choke or throw but Jiu Jitsu wasn’t like that. Jiu Jitsu was hard! I couldn’t punch, kick headbutt, or run! I was being held down and I had to find another way out. 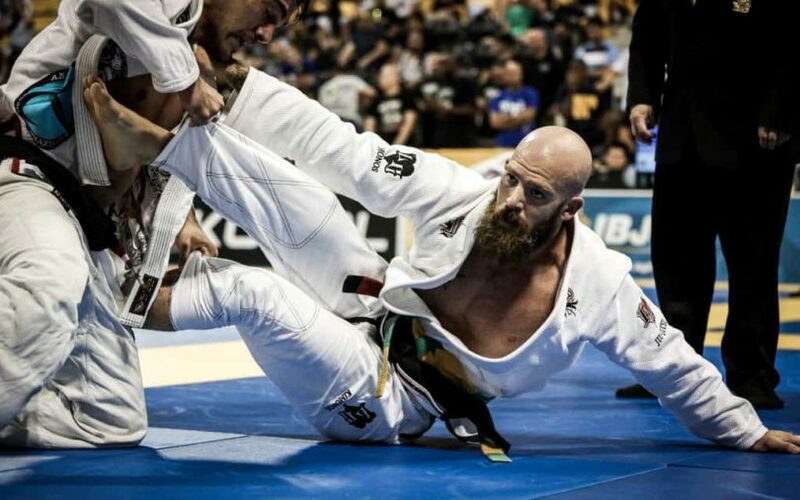 During training most martial arts just don’t offer the same level of resistance as Jiu Jitsu. For some it’s a real hurdle and I’m sure that this is why so many people quit! If you have a black belt in another art it can be particularly humbling – I remember my first class and tapping at the sheer pressure of being mounted! It’s funny now but it was hell at the time! For me though, this is what I really fell in love with. I love being able to use technique, leverage and positioning to gain what I want, on a completely resistant partner. Hard is fun, difficult is rewarding. Jiu Jitsu is all of these things! Learning in the Gi was a revelation! I could never have known how much of a difference that suit would make. Getting choked by my own collar, the other guys sleeve, how did that lapel get round my arm? It was truly mind blowing! Learning when and where to grip and where to not get gripped was possibly the biggest learning curve in my early days of BJJ. I used to cling on for dear life to anything and everything and it ruined my poor fingers! Now that I am a little wiser (and use a hell of a lot of tape) it is not so much of a problem for me. I have even developed a slight penchant for spider guard! These days I love the Gi, and don’t train BJJ without it. Grips give you control, control gives you pressure, pressure presents openings and openings give you submissions! I’m a few years into my BJJ journey now and enjoying it more than ever. I feel like it’s added a whole new dimension to my martial. As a JKD guy I’ve always been about constant evolution and cross training and with BJJ I finally feel like I’m getting to grips with grips!